Our Calf and Thigh Supports provide two 2” wide bands lined with soft elastic that won’t slip, irritate skin or pull leg hair. Two-inch banding helps prevent the “tourniquet effect” that common latex straps can cause. 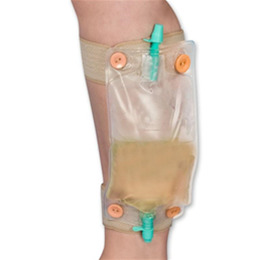 Two-button design fits most urinary bags. Adjustable hook and loop straps are machine washable. Thigh Support fits up to 31” (79cm) upper thigh and 26” (66cm) lower thigh; Calf Support fits up to 20” (51cm) upper calf and 17” (43cm) lower calf. Urinary bags not included.